Air piping is used to provide compressed air to the usage points. The compressed air requires to be delivered with appropriate quality, adequate volume, and pressure to accurately power the components that utilize the compressed air. Completely air tight and simple to mount, the range is ideal for installations requiring the highest quality air. These are energy efficient and do not require labor for installation. The range is best suited for compressor due to its nil leakage and nil corrosion features. Clients can avail this piping into various specifications to suit the industrial requirements. Comparison between Aluminium and other conventional pipe. Light Weight and Modular. Hence Requires no heavy support and No skilled labours Heavy and requires heavy supports. Also skilled labours (welders, fitters) are required. 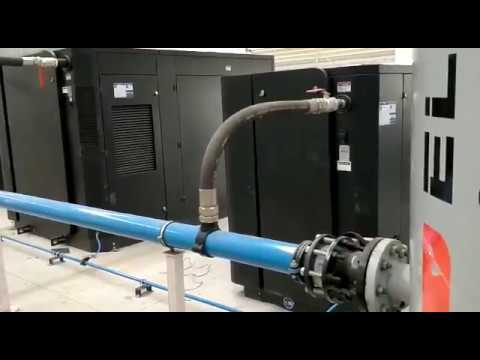 Less Production down time as the system is modular (push to connect). Production down time is more for additional work as there is a lot of welding work required. The ID pipe is specially treated and hence does not react with water to form scaling and in turn gives laminar flow and no friction losses. After a period of time the ID id pipe get corroded due to water and in turn gives turbulent flow which increase friction losses.